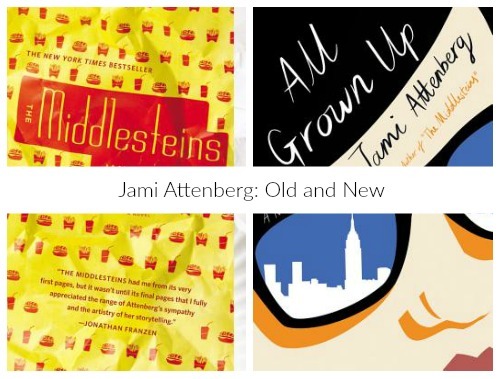 I recently, entirely accidentally, read two Jami Attenberg books simultaneously: The Middlesteins and All Grown Up. Both were impressive examples of Attenberg's powers of observation and her ability to write about the mundane, the everyday, the ordinary in ways that feel unique, universal, and extraordinary. Both are packed with an emotional depth and honesty that resonated with me in ways I'm still working out. But at the end of the day, I loved the former and struggled through the latter. I've spent the last week muddling over why, and I still have no clear answer. So I want to know: have you read these both? Did you love them? Hate them? Want to fall into them or throw them against a wall? The Middlesteins centers on a Jewish family in Chicago. Edie Middlestein is a sharp-witted, intelligent, dominant woman with a less-than-healthy relationship with food, and her slow build to obesity is pushing her into an early death. Her husband, Richard Middlestein, is a middling but not uncaring man of certain bodily desires and emotional needs. Her children, Benny and Rachel, are polar opposites (Benny married to a quintessential, perfectly put together Jewish girl; Rachel renouncing her family's faith and seeking comfort in the bottom of a pint or several). As Edie struggles with her health, the family's story kaleidoscopes inwards and outwards in ways that explore relationships in all their myriad forms: families, partnerships, marriages, children, grandchildren, lovers, friends, parents. The Middlestein family is impossible to like, because they are real and flawed and really flawed, but also because Attenberg writes each of the Middlestein characters with a depth and honesty that brings the worst--as well as the best--of each to light. (Molly Ringwald's narration of the audiobook is also expertly done, breathing life and distinction into each of the Middlestein characters, though it trips up a bit as Ringwald attempts the British accent of one side character in particular.) So though the Middelsteins are not likeable, they are loveable, relatable, and ultimately understandable. They are sympathetic. They are every family. They are imperfectly perfectly drawn characters, and their experiences get at the truth of what it means to love another, to put your trust and faith in someone else, for better or for worse. In many ways, All Grown Up is similar to The Middlesteins. The main character--here, Andrea, a 40-something single woman struggling with meaning and alcohol in New York--is not particularly likeable, though her actions are understandable and generally sympathetic. The story moves fluidly through time, bouncing backwards and forwards with predominantly context clues to place the reader in the right time and place in Andrea's life. But unlike The Middlesteins, the flow of All Grown Up felt aimless and ultimately irritating to me; though I cared about Andrea enough to want understand her, to know her, I felt lost within the novel, directionless, and it was a challenge to continue reading. In hindsight, this aimlessness feels like an accurate reflection of Andrea's inner life, and so I can credit Attenberg's ability to capture that feeling without directly speaking to it. Similarly, I will fully acknowledge sheer moments of brilliance embedded within All Grown Up; I read with a pen in hand and dog-eared several pages throughout the text. But reading this novel was not, at the end of the day, enjoyable or captivating. Which begs the question: Does a book need to be enjoyable to be liked? Or merely appreciated? Where do you fall, and what do you look for you in your favorite novels?